Back in the 1920s, the Industrial Workers of the World, the historic union known for its opposition to capitalism and demand for direct democracy in the workplace, was a vocal opponent of the Ku Klux Klan. Labour unions like the IWW have fought against the far-right since their inception. In trying to build a large union of workers across the world, united regardless of profession or identity, the IWW has traditionally sought to include immigrant workers that far-right groups like the Klan dehumanized. Because of that, the two groups have been known to clash. In the winter of 1924, 175 IWW members marched in Greenville, Maine against the Klan. The call for the march came as the Klan was trying to intimidate the IWW chapter into leaving the town, and at the same time the IWW told the press the Klan was working with lumber companies and the city to end the unionization efforts of lumber workers. In 1936, Canadian IWW chapters directly supported the Spanish Revolution by recruiting soldiers for the the anarcho-syndicalist Confederación Nacional del Trabajo, which was fighting in a civil war against the fascist dictatorship of Francisco Franco, and helped establish anarchism in sections of the country. The movement was repressed three years later by Franco’s dictatorship after the betrayal by the Stalinists. In recent years, IWW General Defence Committees have formed in North America with the mandate to defend the working class against repression. These GDCs have existed since 1917, but following the election of Donald Trump, they have expanded their mandate of defending the working class to explicitly defend the working class and other minority communities from the rise of fascism and the far-right. In light of increasing conflict between far-right groups like La Meute and Storm Alliance, and anti-fascist groups in Quebec, Montreal IWW delegate Éric Default said the need for a GDC here became apparent. That’s a problem, he said, since the far-right tends to recruit in places full of disenfranchised blue-collar workers. Groups like La Meute recruit by playing on worker’s anxiety about the future, specifically by scapegoating people of colour through the argument that immigrants are arriving to “steal our jobs.” If striking workers are replaced with newly hired scabs who are also immigrants, or on a worker’s visa for the job, Default said he understands why some workers might misplace the blame. He specified, though, that the bosses are the ones making that decision, not migrant workers. He’s also noticed that many working class Quebecois people who resent the status quo and the government tend to go towards the far-right, as groups like La Meute and Storm Alliance directly oppose the provincial and federal government. Knowing this, IWW Montreal and its GDC, which still in its infancy, focuses a lot of its attention on trying to prevent people from going to the far-right in the first place. “With La Meute and groups like that, a lot of the people in those groups could be brought back into the good fight if we talked to them a bit, if we organized a bit to go talk to them,” Default said. But if workers are anxious about the future, they should work to take down capitalism and directly advocate for their own rights, instead of scapegoating their co-workers, said Benjamin Gingas, a member of IWW Montreal since 2014. Many of the General Defense Committees, like the ones in Montreal and Toronto which have sprung into existence in the last year, have been inspired by active GDCs in the United States such as as the Twin Cities GDC based in Minnesota. Twin Cities GDC has been running since 2011, beginning with the unique mandate to defend their entire community from oppression. Soon after establishing itself, the Twin Cities defence committee infiltrated and disrupted a secret event by Holocaust denier David Irving, and then organized to disrupt a Confederate flag event. And with the election of Donald Trump and the rise of the alt-right, their anti-fascist work has intensified. Beyond preventing people from going towards the far-right, the Montreal GDC also tries to contribute to the anti-fascist movement in Quebec by sending contingents to counter-demonstrations against the far-right, as was the case on Aug. 20 and Nov. 25, 2017, when far-right groups rallied at the National Assembly in Quebec City. The GDC also aims to defend the people who get arrested in anti-fascist demonstrations by giving financial and moral support, with the goal of alleviating the repression of anti-fascism. The General Defense Committee of IWW Toronto works along similar lines, by raising legal funds for people who’ve been caught up in arrests following anti-fascist demonstrations, and by showing solidarity with them. This could mean things like driving activists to court or coming with them to testify. “The practical support that we can offer, we do,” said Brooke, who works with the GDC in Toronto, and used a pseudonym out of concern for being targeted. Brooke’s GDC also forms coalitions with groups like Solidarity Against Fascism Everywhere to hold demonstrations against far-right groups like the Canadian Wolf Pack—which Brooke describes as a “carbon-copy” of La Meute—the Proud Boys, the Patriotic Europeans Against the Islamisation of the West, and the III% militia. When describing why it’s necessary the IWW be anti-fascist, the Twin Cities GDC said it’s an urgent concern for the union. 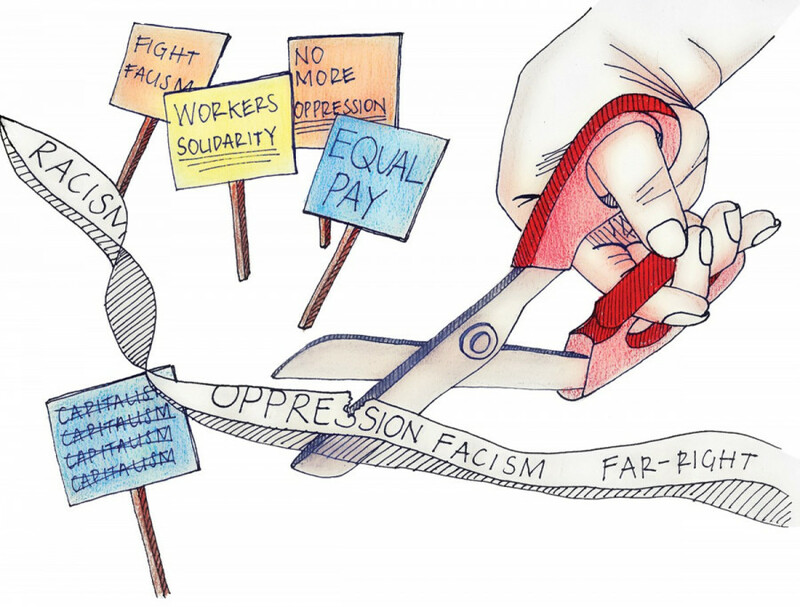 They argue that fascist and far-right groups divide the working class—the mass needed to overcome capitalism, which itself perpetuates oppression. And since fascists and the far-right try to recruit within the working class, the IWW needs to offer a solution to the ills of capitalism in the same way far-right groups do. “Part of the clearer rationale was to establish faith and credit with groups that may have bad impressions of unions, or prioritize other forms of work, and to bring a more diverse group of fellow workers into the IWW,” said Erik D, Secretary of the Twin Cities IWW GDC, to Libcom in a 2016 interview. “Another part was the understanding that if the IWW ever gets close to its goal of genuinely challenging the foundations of capitalism, we will have to have a group and an orientation capable of defending the union and its workers. We didn’t feel that we should wait until the attack came to organize to fight it,” he continued. The Twin Cities GDC has stressed the importance in unions leading the anti-fascist fight because small affinity groups on their own won’t be able to end fascism and authoritarian far-right movements. That’s a sentiment that Default agrees with, stressing that labour unions should be used to facilitate a mass movement against fascism and the far-right, since most people are hesitant to support the use of violent or illegal tactics. There needs to be a combination of both popular anti-fascist organizations as well as affinity groups, because otherwise it’ll just be one extreme group battling the next. But not everyone wants to mask up.